An analysis by the Content Marketing Institute found that healthcare marketers often lag up to two years behind their peers in other industries when it comes to digital content creation and distribution. Why? What’s holding healthcare brands back from consistently creating exceptional content? Often it comes down to not knowing how to tackle the content process effectively. Healthcare is a complex area and many organizations often structure long approval processes, or create bland pieces (or don’t develop much content at all), in order to avoid making mistakes. So, how can your brand overcome this tendency? The new e-book from MDG Advertising, “A 5-Step Plan for Creating Exceptional Healthcare Content,” explores a few simple things organizations can do to boost the quality and quantity of content being produced. The complimentary e-book is based on what we’ve seen work with our own healthcare clients as well as for other exceptional brands in the space. Mastering compliance: Legal and regulatory concerns often hinder healthcare brands’ content development efforts; find out how to deal with these issues effectively. Audience development: Understanding what consumers want is the key to creating good content; learn why persona research is the foundation of digital success. Content strategy: It’s almost impossible for healthcare brands to consistently develop content without a documented plan; explore why this exercise isn’t as hard as it sounds. Being relatable: One of the pitfalls of healthcare content is that it’s all too often dry and technical; find out how to emphasize storytelling and voice over internal priorities. Understanding strengths and weaknesses: Healthcare brands often fail to acknowledge their content limitations and abilities; learn how to overcome this pitfall. Check out the full e-book for in-depth exploration of how each of these steps can help your healthcare brand achieve content marketing success. Improve the quality & quantity of your content for healthy results. Congratulations. You’re well on your way to earning the interest of the 72% of Internet users who searched for medical information online last year. Here’s how to earn a bigger share of this lucrative healthcare market. 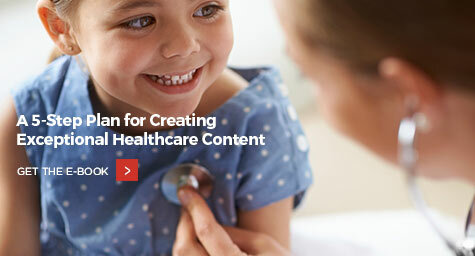 Discover the latest tactics for successful healthcare content marketing. Contact MDG Advertising today at 561-338-7797. MDG Advertising, a full-service advertising agency with offices in Boca Raton and New York, NY, is one of Florida’s top healthcare marketing companies and branding firms, whose healthcare clients include Dental Care Alliance, MDVIP, Max Planck Florida Institute, HCA East Florida, Primary Pharmaceuticals, and MD Now. MDG’s core capabilities include branding, logo design, print advertising, digital marketing, mobile marketing, email marketing, media planning and buying, radio and TV advertising, outdoor, newspaper, video marketing, infographic development, website design and development, content marketing, social media marketing, and SEO. To learn more about the latest trends in healthcare marketing, contact MDG Advertising today at 561-338-7797.